This is a review of The Atlantis World (The Origin Mystery, Book 3) by A.G. Riddle. This is the final installment of The Origin Mystery trilogy and in my opinion this book is a little far reaching for the previous books and seems like a whole new story because of the weak connections to the previous too. I honestly don’t know what I would name to be my favorite part of this book because of its general averageness but if I were to say the best part about this book it would be the character Ares. He distinguishes himself as the most influential character of the book, maybe millions of years old and having been awake for hundreds of thousands of years, wise from seeing his wife and his home planet destroyed and extremely motivated in the most trying of times, his long life is revealed and along with it the decisions he has made that have shaped the universe and Earth itself. The Immari organization, who have dominated the story so far, become virtually useless now, simply a tool for Ares to reduce the population of Earth to some few dejected humans. Kate and David will still remain in pivotal roles in this story along with their band of world savers made up of a motley crew that once again is uncannily tied together in their history. Mary Caldwell is a renowned astrophysicist who has been searching for signs of something or someone else with us in the universe, she is the one who receives the distress signal in response to Janus’ signal from Earth and this signal is what sends both the good guys and Ares’ crew on an inter-universal goose hunt, she is also conveniently the ex-husband of Paul Brennar. Paul Brennar is also along for the ride on this adventure and he is just what the doctor ordered, a genius who has dedicated his life to genetics researching, something that will become pivotal as the story progresses and something that has shaped Earth, countless other worlds and the universe up to this point. Faithful Milo is also here, being one of the few characters whose skillset is not perfectly tailored to fit the problems that arise in the book he still provides a faithfulness and optimism that give the story some much needed diversity in character and liveliness in a very dry, dark and scientific story. Last, there is Sonja the extremely capable former leader of the Ceuta rebels who was trapped in the Gibraltar Atlantean ship in the wake of Ares’ Antarctic wave. The biggest organizations in this story suddenly become races that span the entire universe. First, there is the civilization that Ares built in the wake of his own worlds destruction and the home place of Janus and Isis. The “Laborers world” that Ares established with the lower social class of his second home world and then eventually destroyed due to his programming of the sentinel spheres. There is also the Serpentine race, the mysterious entity who destroyed both Ares world and countless others around the universe in hope of harnessing the power of “The Origin Entity” and in doing so putting the universe in balance and having complete control over space and time. The race that saved Ares after the destruction of his home world was also a broken off branch of the serpentine race who have been long extinct but left behind the legacy of the sentinel spheres and the regeneration home ship which save the Atlanteans countless times. One of the least believable aspects of this book is one that is fundamental to the plotline and this is the fact that the dominant species that will appear in every ecosystem in the universe is humanity or humanoids; the book is founded upon the fact that this universe is ideally suited for human species’. It also says maybe in some parallel reality the universe could be ideal for another species. This is why all the alien races that discover Earth are humanoids and why the Serpentine race is looking to assimilate all human races in their goal of universal power. From the moment that Ares was rescued from the destruction of his race and chosen to resettle their destroyed civilization he had hatched some secret plan to destroy the serpentine race for what they had done to his people and his wife. He was of course warned when he was rescued that to pursue a life in the hope of destroying the Serpentine Race would lead to his and many other human race’s undoing by the avatar of the long extinct broken branch of the serpentine race. What we don’t know for most of the story is that Ares was genetically shaping the human race to be the undoing of the Serpentine Race when they tried to assimilate Earth and this genetic Trojan horse is deployed when they get their hands on their first human, David. In the end David and Kate both lived and helped the Laborer Race and the Human race survive and now plan to live out their lives and try to make a family and raise the son of Dorian and Kate that they discover is still alive but was placed in an Atlantean tube by Dorian. Dorian himself got tired of being Ares’ puppet and eventually killed the Atlantean soldier hundreds of times before he disabled his own resurrection and Dorian promptly blew himself into outer space to take his own life. I found the books in The Origin Mystery series to be extremely interesting and diverse in their ideas and setting but they were also very confusing as well as hastily and sometimes sloppily tied together. These are some good reads if you are not easily confused while reading but may be over the head and out of reach of some younger readers. 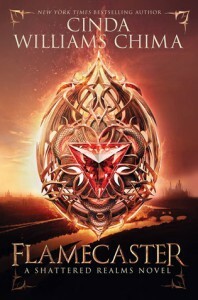 This review is about Flamecaster by Cinda Williams Chima and appears to be the first book in what will be a new series of books called the Shattered Realms series. This series appears to be a continuation of the 7 Realms stories but much farther down the timeline to where the 7 Realms main characters have aged substantially and the mostly young main group is grown up now. This opens the story up for new main characters, many of which are the children of the main characters of the 7 Realms Series and some are simply new characters. Having read the 7 Realms series as well as The Heir Chronicles and loving both of them I was very excited for this book and was not disappointed. The story begins in the Fells with Adrian sul’Han aka Ash, our main character. The son of Han Alister, aka Cuff or the main character of the 7 Realms Series, Ash is also a gifted wizard but also a very gifted healer, though his healing career has been limited to animals thus far. We quickly discover that Ash and his family have recently been through the tragedy of losing his sister and heir to the Grey Wolf Throne, Hanalea ana’Raisa or Hana. Ash thought Hana was the perfect fit to be Queen and thinks of himself as the misfit replacement and his family has not been the same since she died fighting Arden. His father Han also now has reason to believe that she was no victim of accident either but she was targeted and that there is a traitor in the Fells who gave information to Arden that lead to Hana’s death. In addition to all this, the Grey Wolves have started appearing to their family, a clear sign that the Grey Wolf line is in danger. After a meeting with his father, Ash believes that his father is the one in danger but when he goes to warn his father he quickly realizes that he is the real one in danger when he is attacked. In an attempt to save his son Han forces the kidnappers to let Ash go but pays for it with his life. Having just seen his father be murdered and unable to confront his family because he feels responsible, Ash flees the country to Arden to meet up with Taliesin Beaugarde, a Voyageur healer that he hopes will train him at Oden’s Ford. Taliesin agrees to train Ash but what she does not know is that Ash will spend the next few years of his life becoming an incredibly skilled assassin and the bane of Arden, the country that took his father and sister. During this time the Fells and Ash’s family will not know what happened to Ash and he will be presumed dead, another great advantage for an assassin. Our second main character is Jenna, a girl who has been condemned from her childhood to work in the mines, she is also mage marked, bearing a marked stone that appears to be part of her neck, she and her family have been told this means she is powerful but in great danger. Her life is changed the day that her king, King Gerard, came to her mine and killed her young friend Maggi and her best friend and lover Riley. She tries to kill king Gerard but miraculously survives due to the heroics of Riley and is knocked unconscious. When she awakes she in the presence of Fletcher, a mineworker who moonlights working for the Patriots, an organization dedicated to destroying the King and bringing peace to Arden; from that day forward Jenna is a Patriot. Both pursuing their lines of work trying to dethrone Gerard and either free or destroy Arden they destroy much of value to the country and kill many of its soldiers, yet when they come into the sights of king Gerard and his wizard servant Destin Karn it is not because of their rebellion. When an attempt on Ash’s life by a priest of the Church of Malthus, the official church of Arden, and its Darian Brotherhood, the anti-wizard brotherhood devoted to killing wizards and sucking their blood, it is because they have discovered his true identity.. Ash escapes with the help of Lila Barrowhill, an unexpected ally who Ash distrusts, rightfully so since it seems she is playing on his side and the side of Destin Karn, so he quickly ditches her. After the attempt on his life though he thinks he has not been raising the stakes enough and decides he can no longer go after the the lackey’s of Arden, he must kill King Gerard. In doing this he travels to Ardenscourt where he will become a master horse healer and eventually the favored healer of the King himself, but still unable to commit his most important murder because of Gerard’s paranoia. When Delphi, Jenna’s hometown and base of operation, is occupied in search of her it is not because she is a major player with the Patriots but rather because someone is looking for her because of her magemark and King Gerard is eager to claim their bounty. Jenna disregards the advice of her father to leave Delphi while the hunt for her continues; in light of her decision her father gives her the items of her birthright that had been left by her ‘grandmother’. These items are very mysterious for a random orphan; a dragon dagger, a breastplate and an astrolabe pendant all made for a woman. She also is quickly realizing that she has mysterious gifts like the ability to read people on a deep level, absorb magic from wizard attackers and her gift since birth of immunity to heat. Soon after that her father is dead by the hands of Destin Karn’s lackey Clermont and Jenna finds herself in the hands of Destin, dying on her way to Ardenscourt from her mysteriously deadly self inflicted wound from the dragon dagger. This is where she and Ash will meet. Ash will be instructed by Gerard to heal her and will succeed with his powerful healing skills but not before they share a sort of mind melding that will forever link the two of them and leave no doubt to each other who they really are. 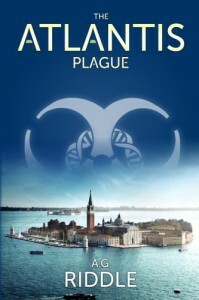 This is a review of The Atlantis Plague (The Origin Mystery, Book 2) by A.G. Riddle. After reading the entire trilogy of The Origin Mystery I believe this is the best book of the three it has much more clarity than the first and adds some interesting ‘out of this world’ aspects without going overboard like the third. My favorite part about this story is the characters, the new and developing characters in this book are really diverse and interesting and while I wish some of them would play larger roles I also can just enjoy what they do accomplish. The Immari are also now placed as the dominant world power, rising over nations because of their preparedness for the the plague and the world they knew would follow. The rest of the world including the US in this story is basically hopeless and constantly trying to simply survive the plague, never really being able to repel the Immari when they invade or make any real progress against the plague besides the almost useless Orchid program. This story starts out with a very somber feel, from the last book you know that David is dead, but somewhat reincarnated and Kate is being held hostage, sort of, by Martin; both are looking for answers to the Atlantis plague but Kate seems to rapidly be losing her will to continue under such dire circumstances. Kate, Martin, their Center for Disease Control counterpart Paul Brenner and the whole world seem to be losing hope in the fight against the plague and while the world falls into disarray, the Immari swoop in to offer ‘hope’ and ‘salvation’ from the plague and this broken world. The newest development in the book is the fact that David and Dorian are indeed alive and not just forever stuck in these ‘hibernation tubes’ (incorrectly named because they are truly resurrection tubes. David and Dorian are released from their tubes and proceed to have yet another fight to the death for the entertainment of this new Atlantian, ominously named Ares; Dorian does win and kills David again, but not without a little head start granted from Ares, this time Dorian is assured David’s death is final, although once again he will return, much to the chagrin of both Ares and Dorian. Both Kate and Dorian learn about the strange twist of fate that led them to inherit the memories of the Atlanteans Isis and Ares respectively. Yet, with Ares to guild Dorian in real life he becomes the Atleantean’s tool to once again take control of Earth and guild it to the purpose he believed they were destined for. This purpose once again is tied to the Atlantis Gene; something the Immari still have not mastered and therefore are still looking for Kate to help them unlock its secrets. Because of the imminent Immari threat Kate and Dr. Martin are constantly fleeing the pressing danger to try and continue their research, meanwhile Dorian retakes control of the Immari and hunts Kate for her information while Ares furthers his plans for Earth. Around the same time David is once again resurrected in a shard of the Gibraltar ship and sets his mind to once again finding Kate and keeping her safe, a tall tale for the most wanted woman in the world. But now the clock has really started spinning because Ares has accelerated the rate at which the plague is killing people and has rendered the Orchid drug, the only drug capable of slowing or stopping the Atlantis Plague, null. The first time Kate and David are reunited David almost kills Kate by sinking her boat but promptly saves her and the two are reunited and joined by some of the most interesting characters this book has to offer. Doctor Janus, the genius doctor who somehow knows more than anyone about the Atlantis Gene besides Kate, Doctor Chang the sketchy Immari scientist with a half conscience and no real alliances, Shaw the SAS super soldier who David chronically distrusts and Kamau the former Immari soldier who owes a debt of his life to David. Along with David and Kate they form the group that is now charged with discovering the secrets of Martin’s notes, because Martin is recently murdered and ultimately discovering the key to the Atlantis Gene and from there a cure to the Atlantis Plague. By joining the knowledge of some of the greatest genetic minds in the world, along with David’s out of nowhere History PhD the group manages to put together a timeline of what they think is the major genetic forks in human history and decide they must find the genetic ‘Adam’ to try and fill in the gaps of their missing cure. All the while one of them is a mole that is feeding information to Dorian and has murdered Martin. During the entire story Dorian and Kate are having these memory flashes or dreams that are extremely vivid and not their own memories, they both discover these are the memories of the Atlanteans who they are connected to and their memories are beginning to affect them and merge towards the meeting of their two Atlantean counterparts. They both realize that they are in the same situation without actually physically interacting and both know their paths will converge just as the Atlanteans did. Upon finding the ‘Adam’ subject they are looking for the story suddenly diverges and the biggest plot twists of the book occur. Adam Shaw does indeed betray the group, he kills Dr. Chang and Kamau, kidnaps Kate and it is revealed that he really Adam Keegan son of Howard Keegan and practical brother to Dorian Sloane. Janus seemingly betrays the group too but he betrays them not for the Immari or for his personal gains but for the safety of Earth and it is revealed that he is really one of the two Atlantean scientists who came in the ship from Gibraltar and was part of the altering of the human race and the accidental creation of the bell and the disease it would release. Janus is attempting to undue everything that he and his partner Isis did and make the humans as they were when they found them over 75,000 years ago. Janus is only convinced to help David when he tells him that Kate contains the memories of his partner Isis who he was deeply in love with. 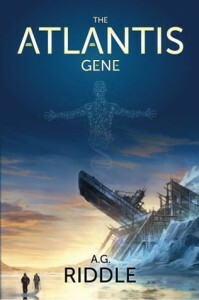 This is a review of The Atlantis Gene (The Origin Mystery, Book 1) by A.G. Riddle. This was an interesting book for me, the moral of the story I had heard before but at the start of the book I never saw foresaw how it would end and the book seemed to take a turn every time I had grasped what was going on. This constant change in plot and theme left me confused and unable to grasp the whole picture of the book or even what I had just read, a frustrating thing for an experienced reader. The first few chapters of the book held important information for the rest of the book but the setting and backstory to people like Josh Cohen and things like Clocktower seem to be vital to the story but have almost no bearing to the total plot and what effects they have seemed very forced. Also, the Immari Organization is the focal point of everything that unfold in this story and is simply followed and barely decoded by our two two protagonists David Vale and Doctor Kate Warner, both of whom I find to be great characters with good backgrounds. The past and the future just seem to blend too perfectly in this book. Things like Kate reading the journal of Patrick Pierce, while unknowingly being his daughter, to Dorian Sloane really being Dieter Kane and them both being healed and preserved in Atlantian tubes and meeting their fathers because of a gravity time distortion are just some normal things in this book; and in my opinion everything is too perfectly connected and the main characters have way too many connections from the get-go that pop up at almost every new discovery in the book. The same kind of principle applies with the Immari and the history of the human race. Every worldwide catastrophe and important event in our history seems to be linked and it is all somehow connected to the mysterious ‘ships’ around the world (only everyone in the book thinks these ships are just unmoving structures left by a long gone race and they are only partly right). Although I disliked all the connections with the characters, the historic connections are interesting, like strings all going from important historic event to the Atlantian origin and people can only guess what they mean. The one constant in this book besides the main characters is the Atlantis Gene (fitting because of the book title). The gene has been sought after by the Immari for decades and is the greatest mystery to the all powerful organization, along with the Antlantian ships. The book revolves around two main characters. The first, David Vale, ex-special forces, CIA and Clocktower operative, who is highly motived, intelligent and skilled and has been fanatically tracking a shadow organization whom he believes was the real author of the 911 attacks, which took his wife and his life as he knew it. The second, is Kate Warner, a brilliant autism doctor with a painful past and an uncertain future that uses the pain of her past to try and push forward and help the greater good. These two collide quickly in the story when both their lives are rocked by attacks on their organizations that lead to realizations about what their organization really were and what their life’s work has amounted to. Both struggle to grasp who and what they really worked for and do not discover the real truth until the end of the book, when it is almost too late. Years of training keep David alive and motivated to decipher and confront his true enemy and his gut and morals make him protect and bond with this new Doctor he is aligned with. While David and Kate struggle to get information from their unknown inside source and unravel the mysteries of this shadow organization, the Immari hunt David and Kate, knowing both could undue plans decades in the making and needing information from Dr. Warner. The Immari’s hunt is lead by the ruthless and cunning Dorian Sloane, later found to be Dieter Kane who proves to be a third main character and the constant antagonist. Kane will stop at nothing to destroy David, capture Kate and make her life a living hell and recover his father, Konrad Kane, whom he fanatically believes is alive after over 70 years. Both sides hunt desperately for the secrets of the ‘Bell’ and the plagues it has released time and time again, the mysterious ‘ships’ found around the world and the Atlantis Gene which seems to be the key to everything. David and Kate on one hand are fighting what they think the Immari will do with all the answers and to save the human race as we know it and Kane and the Immari are fighting for the final steps to their goal and the ‘saving’ of the human race through unimaginable methods. 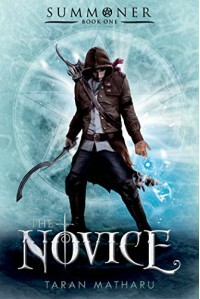 So this is my first review and although I’ve read a lot of books in this category that I would like to review I will start with one that I just finished today and that is The Novice: The Summoner Trilogy Book 1 by Taran Matharu. This book was set perfectly for me because it had all the aspects of a mythical kingdom of old that I desire in a book: the constant of war between humans and another prominent species (in this case the orcs), the mystery and wonder of summoners and spell crafting to common people such as Fletcher and the interaction of various prominent species, with Orcs, Elves, Dwarves and Humans being historically very popular choices. Matharu also does a great job inserting a wide variety of interesting monsters and mythical creatures, demons he calls them, and making them minor characters as individuals that still play a large part in the story. The one element of the setting that surprised me was the fact that humans have such a huge advantage over all the other species. They defeated the Orcs thousands of years before the story takes place and are clearly superior in fighting force and intelligence, so they have been destroying Orc lands to expand their own; Elves were once their allies but now they are engaged in a political war that the humans clearly own and the advantage of the humans in obvious in the fact that the one major elvish figure in the story is their first Summoner in centuries; and last the Dwarves who, were once the first peoples to inhabit Corcillum and now control the most powerful weapon wielded by the common man, guns, yet they live beneath the heal of the humans and are highly discriminated against and forced to live in disgrace because of decades old transgressions. 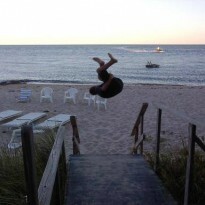 The story is based around a young orphan named Fletcher who grows up in the small northern town of Pelt. He is a young resourceful boy raised by the blacksmith that found him as a baby and raised him as his own son. Yet, he has no aspirations for himself beside what he can achieve at his station of blacksmiths apprentice and is downtrodden by the immoral characters of Pelt with little resistance, only the hope of subtle retribution. Fletchers whole story is changed however when a seasoned soldier comes to Pelt to sell his spoils from the Orc Front and gifts Fletcher with the book of a fallen summoner from the front lines. Fletcher covets the book but quickly finds out it has even more meaning than he could have imagined when he summons a demon, discovering he himself is a summoner and at the same time banishing himself from Pelt and branding himself a fugitive. He travels to the Adept Military Academy in the heart of Hominum Empire with his new demon Ignatius and is enrolled to become a summoner trainee, to enter into the army as soon as he proves himself. There he discovers his soon to be closest friends in the form of a wiser than his years and trustworthy Dwarf named Othello and an Elf named Sylva who starts out as an untrustworthy diplomat for the scheming elves but quickly turns into the smart and driven capstone for this interspecies trio. Together they will break the bond of species and rise through the ranks as summoners to all be hailed as the highest of their class and prove themselves to be far greater contenders than anyone would have though for a fugitive and two ‘inferior species’.